We would like to thank all of our contacts and friends from Camp Pendleton, to Mira Mar, to 29 Palms for believing in MCB’s mission to provide the very best service and quality product, while maintaining a product cost that conveys to the military families how much we appreciate what they do for us! 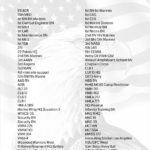 We are pleased to announce that due to our commitment to provide our military service men and women the highest quality in Military photography services, and our unwavering commitment to provide the very best photo quality, our client list grew in 2017 [from 59 events in 2016] to 68 Battalions and Squadrons! We support our military familes on Camp Pendleton, Base Mira Mar and Base 29 Palms! 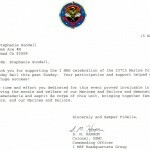 MCB receives a personal thank you letter from Commanding Officer, S.M. Hanson, for a job well done at his Marine Corps Birthday Ball!